Soaring oil prices in 2005 have helped Royal Dutch Shell report a record annual profit for a UK-listed company. The Anglo-Dutch energy giant generated profits of $22.94bn (£13.12bn) - up nearly a third on last year when it set a UK record with profits of $17.59bn. The results follow a year in which the cost of crude jumped from below $45 a barrel to break the $70 mark. Most of Shell's profits come from finding and extracting oil, and then selling it on to the markets. Little, if any, profit comes from forecourt sales of fuel - which in the UK attracts among the highest taxes in Europe. That has not stopped road lobbyists calling for Shell to reduce prices. The cost of crude oil rose sharply last summer as a number of factors combined to push up the price. Continued demand from countries such as China and the US came at the same time as political tensions in a number of oil-producing countries, and output in the Gulf of Mexico was affected by a series of hurricanes. 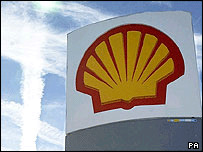 As well as the annual figure, Shell also unveiled a fourth quarter net profit of $5.395bn. "Our good performance in the fourth quarter 2005 gives us a solid platform to build on in 2006," said chief executive Jeroen van der Veer. "We delivered record cash and earnings. Success in exploration and gaining access to new resources continues." He said production expectations for the year had been met, despite the impact of the hurricanes. The firm said that efforts to get its damaged Mars platform in the Gulf of Mexico back into operation should be concluded in the middle of 2006. Mr van der Veer said the company would invest strongly in new energy technologies, in a week when US President George W Bush warned of "addiction" to oil and said alternative fuels to compete with petrol could be produced within six years. Ruth Bridger of the AA said: "Shell should be putting more money into research and development to get away from an oil-based economy, and look at developing new alternative fuels such as hydrogen cells." Shell also indicated it would buy back shares totalling $5bn during the coming year. "We focus on delivery now and building the future," said Mr van der Veer. Shell said its reserve-replacement ratio, the capacity to replace pumped oil with new oil, was 70 to 80%. Firms aim for a rate of more than 100% to keep their asset base solid. In 2004 Shell's reserve-replacement ratio was less than 50%, leading to criticism from investors. Shell's results come after Texas-based oil giant Exxon Mobil this week revealed $33.86bn profits in its last financial year - the biggest so far in corporate history. Some analysts said Shell could have done better given Exxon's figures. "Things are as expected, but the result in itself is a bit disappointing," said Jaap Barendregt, at FBS Bankiers. "We could have expected somewhat more given the surprise we saw with Exxon." In December, Shell cut its plans for North Sea exploration, blaming Chancellor Gordon Brown's tax hikes for the move. Instead Shell is focusing on other parts of the world; in the fourth quarter it said 20 successful exploration wells were drilled in Australia, Brazil, Brunei, Egypt, Germany, Malaysia, Netherlands, Nigeria, Oman, UK and USA. And in November it started pumping oil from a huge new field off the Nigerian coast.